Anglo-American rabbi and Hebraist; born in London 1800; died at San Francisco, Cal., Sept. 4, 1879. He was educated at the Jews' Free School, London, of which he was afterward principal until 1842. In this capacity he was the acknowledged bulwark of the London Jewry, especially in resisting the endeavors of the Society for the Conversion of the Jews. He was one of the founders of the Jews' Hospital and Orphan Asylum. In 1836 Henry compiled a volume of the daily prayers according to the German and Polish rites, and in 1840 published a "Biblical Class Book for Jewish Youth" and a "Synopsis of Jewish History." While principal of the Free School, he officiated frequently in London synagogues, and in 1844 became rabbi to the St. Alban's Congregation, where he remained until 1849. Here he made pulpit addresses in English a regular practise—a novel feature in those days. In 1849 he embarked for America under engagement to the congregation at Louisville, Ky. He was, however, unavoidably delayed at Cincinnati, and accepted a position tendered to him there at the B'nai Jeshurun Synagogue. 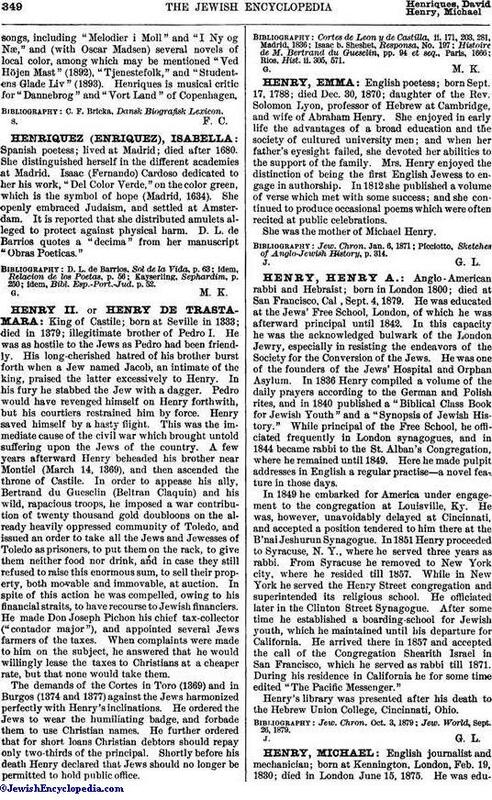 In 1851 Henry proceeded to Syracuse, N. Y., where he served three years as rabbi. From Syracuse he removed to New York city, where he resided till 1857. While in New York he served the Henry Street congregation and superintended its religious school. He officiated later in the Clinton Street Synagogue. After some time he established a boarding-school for Jewish youth, which he maintained until his departure for California. He arrived there in 1857 and accepted the call of the Congregation Shearith Israel in San Francisco, which he served as rabbi till 1871. During his residence in California he for some time edited "The Pacific Messenger." Henry's library was presented after his death to the Hebrew Union College, Cincinnati, Ohio. Jew. World, Sept. 26, 1879.